This is my post for Sweet punch -August 2011. As I did not do for last couple of months I badly want to do this. This week was bit busy week as school reopened, luckily the recipe is quite simple and I managed to do this today. 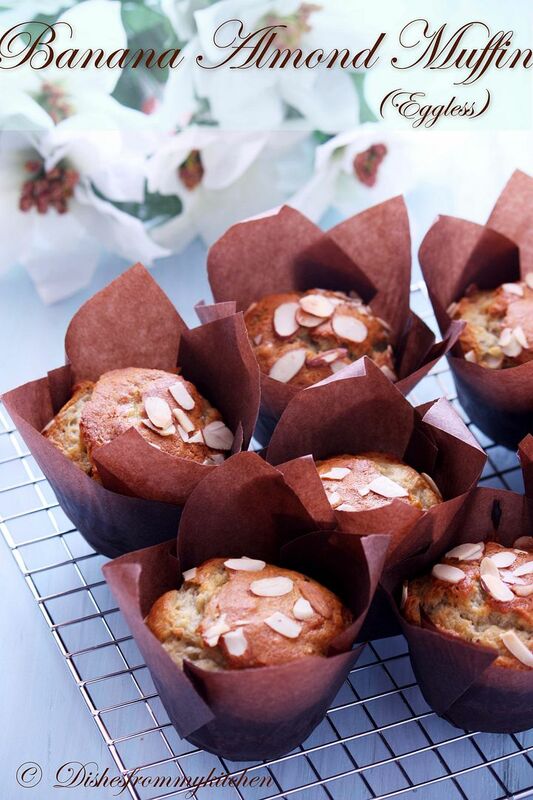 The Recipe given by the team was strawberry Banana Muffin. Unfortunately I did not have strawberry in hand :( So just went with Banana and almonds(eggless version for a twist). I am giving both versions of Muffin with Egg and Eggless. Hope you all enjoy these muffins. 1. Preheat oven to 350 degrees F (177 degrees C). Place the oven rack in the center of the oven. Line a 12 cup muffin pan with paper liners. 2. In a small saucepan melt the butter. Let cool to room temperature. 3. In a medium sized bowl whisk mashed banana, melted butter/oil, salt and sugar. 4. In another large bowl sift flour,baking powder, baking soda, cinnamon, and salt. 6. Divide the batter evenly among the 12 muffin cups, using two spoons or an ice cream scoop. Place in the oven and bake until a tester inserted in the center of a muffin comes out clean, about 20 to 25 minutes. Transfer to a wire rack to cool. 7.Makes 10 to 12 regular sized muffins. 1. Preheat oven to 350 degrees F (177 degrees C). Place the oven rack in the center of the oven. Line a 12 cup muffin pan with paper liners or lightly butter or spray the muffin cups with a vegetable spray. 6. Divide the batter evenly among the 12 muffin cups, using two spoons or an ice cream scoop. Place in the oven and bake until a tester inserted in the center of a muffin comes out clean, about 20 to 25 minutes. Transfer to a wire rack to cool. Can be stored for a few days at room temperature. 7.Makes 12 regular sized muffins. Both versions look fabulous.. awesome pics... 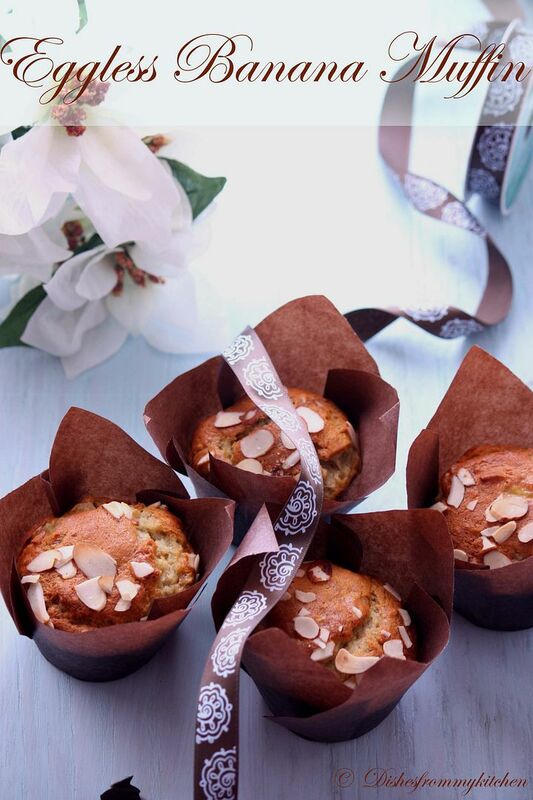 The texture and the softness of the cakes really comes through:) Beautiful..
fabulous muffins - the pics make them all the more yummy - great work ! 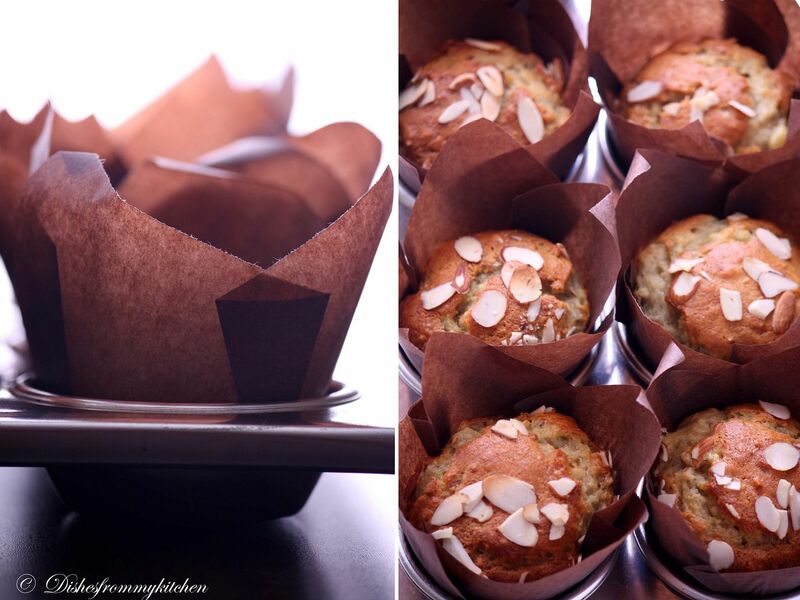 great muffins and great pictures! I am in love with the paper liners! !had been meaning to do something similar for ages now!Muffins look fluffy and moist,glad that you enjoyed baking it! 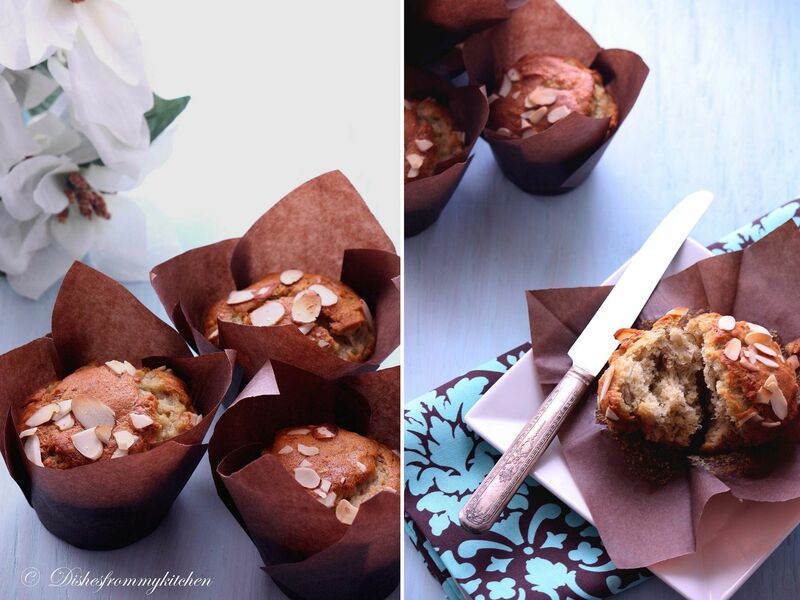 I love the combination of banana and almonds, lovely texture, Yummy! Simply fabulous! I love it soooo much! Pavi - the bistro in my office sells these type of fancy muffins. Now, when are you opening your own shop - I want to buy from you soon. Perfect Professional Muffins - as always! Looks so soft and moist... Nice combo of flavors. Both version looks super,it looks so soft!! 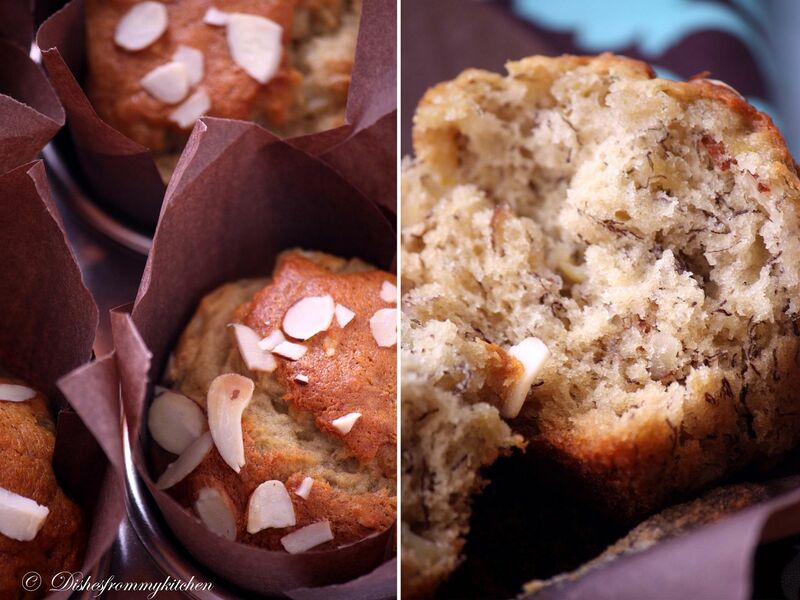 Spongy and perfect muffins, Pavithra..Love all the stunning clicks..
omg! these look awesome...whr did u get these brown color parchment paper?? Wow these muffins looks heavenly and very inviting. I wish i could get few of those. Its a perfectly professional looking muffin with a homely feel. Love the texture and look of the muffins. You rock. Fabulously done. I hope I can participate in the september challenge. The photos have come out gorgeous. Good to see both versions Pavi and the muffins look too good. Love the idea to use paper liners and I just love this idea. Want to try the same :) Lovely clicks as usual! wow...this looks like a flowers...really great idea...surely kids will like it!! Awesome! Love both the versions! They were really tasty right. I think almonds would have made them even more tasty. 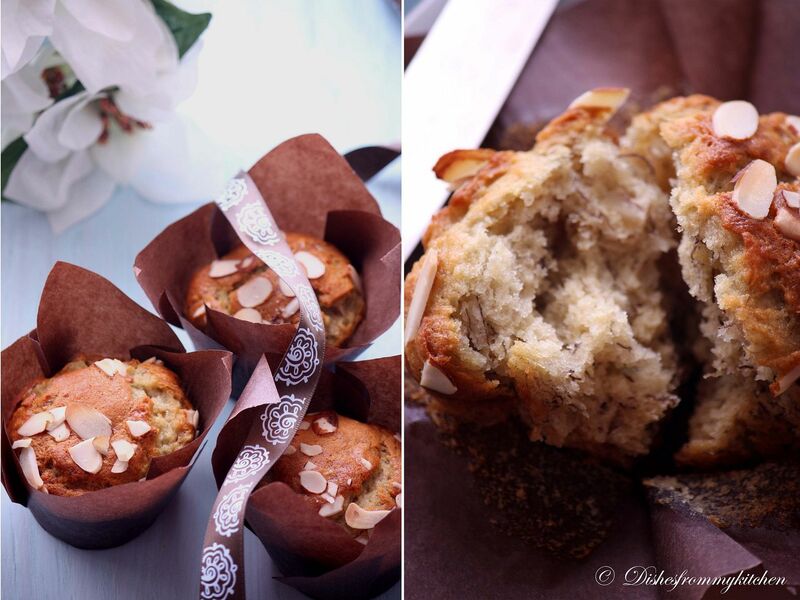 Soft & light & perfect muffins!!! Splendid clicks!! Love your cupcake liners more than the muffins :) The color of the liners are that of the cake go so well together, Muffins look delish Pavithra! wow!! first time to your space dear!! !happy to stop by and follow you, I read your profile, find quite interesting happy to know that ur hubby encourages you to blog.....indeed family support is need for every blogger to make a perfect blog like ur's. make time to visit my blog too!!! Muffins look so amazingly moist and fluffy! I would love to add some choc chips for extra punch! Lovely muffins. I totally love the flavor and the flaky almond topping! Delicious looking muffin and love the liners you used ! Amazing looking muffins. The insides look so fluffy! I specially like the liners(parchment? ), did you make them yourself? Excellent recipe.. Thank you so much as I got a great dish to cook n serve..